This is the finale to the Danish Christmas meal, served on Christmas Eve. 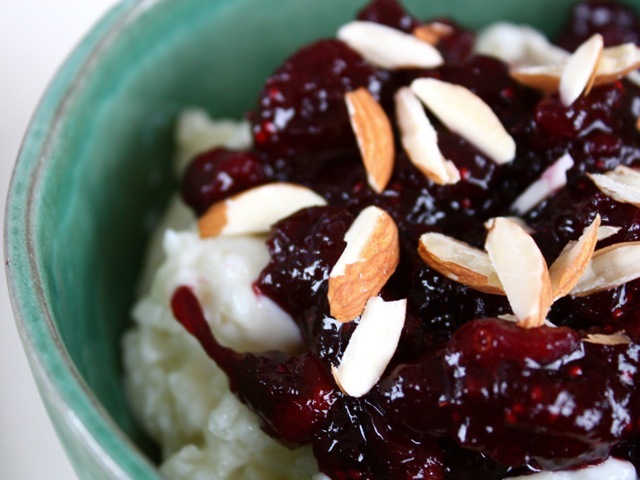 In the past, there was just one almond hidden in the whole pot of rice pudding, and it would bring luck to the finder. Nowadays they are more liberal with the almonds. The Danes serve this dish with a berry compote, usually made with dried or tinned sour cherries, but I like it with the tartness of cranberries. This is too good just to serve at Christmas, so make it any time from October when the first cranberries appear. Make the wine-poached cranberries: Put the red wine in a saucepan with the sugar and cinnamon. Heat slowly, stirring a little to help the sugar dissolve. Put the cranberries into the wine, turn the heat up until the liquid is simmering, and poach slowly until the berries are tender, about 20 minutes. Removed the poached berries to a dish and reduce the wine by boiling until you have about 1 cup left. Let this cool slightly, then pour it over the cranberries. Remove the cinnamon stick. Make the rice pudding: While the berries are cooking, put the rice, milk, and sugar in a heavy-bottomed saucepan and gently bring it to a boil. Turn the heat down low and leave the rice to cook, stirring it frequently, for about 15 minutes, or until the rice is tender and the milk has been absorbed. If the milk is absorbed too quickly — perhaps because the heat is too high — add a little more milk. Stir in the vanilla extract and almonds. Assemble the dessert: Let the rice cool, then fold in the whipped cream. Serve cold or at room temperature with the warm berry compote. Culinate editor's notes: Pudding rice is a short-grain rice available in Britain but hard to find Stateside. You can use any kind of white rice instead, although short-grain rices (try Asian sweet rice) will cook up better than long-grain rices. Allow 30 minutes, not 15, for ordinary rice to cook. This recipe makes an enormous quantity of pudding; cut it in half and you'll still be able to easily serve 4 to 6 people. Here's a cheat sheet for halving the recipe: Cranberries 1¼ cups red wine (Marsala wine also works well, and a slug of Grand Marnier provides a nice citrusy touch) ½ cup sugar 1 cinnamon stick (don’t bother trying to hack a stick into quarters) 9 oz. (2½ cups) fresh or frozen cranberries Pudding 6 oz. (¾ to 1 cup) short-grain white rice, rinsed well and drained 3 cups whole milk ⅓ cup sugar (don’t halve this amount; the original recipe is undersweetened) 1½ tsp. vanilla extract 1½ oz. slivered almonds (or less, if you’re just using them as a garnish) 1 cup whipping cream Since cranberries are high in pectin, you can skip the boiling-down-the-wine step in the original recipe; the sauce will thicken nicely on its own. And the folding-in-whipped-cream step is a lovely thing, but you can also skip it and still feed five dinner guests dessert.